The following is a problem-solve document that systematically describes the process - from screen making to screen printing - outlining the most common indicate respective solutions. Most problems occur during printing, however, this does not exclude problems that may result from issues in the screen making process. To help save time and money, quality control after each step in the process is highly recommended, as is the frequent use of standard tools: tension meter, emulsion thickness gauge, thermometer, relative humidity meter and a Rz meter. The frequently occurring problems I've noted were observed during quality control of the indicated process step. The sequence is completely random. For distinctive purposes, we are looking at edge defects (the problem is caused during the creation of the edge of the print image) and surface defects (the problem is caused during the creation of the surface of the print image, which is often a solid). These can all be minimized by adjusting these parameters accordingly. This can result if the emulsion is outdated, the dry temperature too high, the emulsion prematurely exposed by unwanted UV light, or if a film positive with insufficient density is used. The problem may be solved after decreasing the dry temperature, removing the source of unwanted UV light, taking a fresh emulsion and using a sufficiently dense film positive. When undesired fine details are printed, this problem may occur if the squeegee pressure is too high or if the ink viscosity is too low. It can be resolved by reversing these parameters. Low ink viscosity and/or a Rz-value that is too high may cause a positive sawtooth. The Rz-value should not exceed seven microns. The tailing edge of the image does not print if the squeegee pressure is too low or if air is trapped in the stencil during squeegee movement. The latter may be caused by too much EOM, high squeegee speed, high ink viscosity or low Rz-value. A thinner EOM and a higher Rz-value is usually the solution. This may be caused by a difference in the fabric's tensions, frame sizes, snap distances, squeegee blade lengths or temperature during drying. It can also result from a sudden tension drop of the fabric, which may be caused by an incompatible or aged adhesive. Color- to-color registration can be improved by using the same parameters for the complete color set and a compatible adhesive. A thick EOM may create a narrow area with more ink deposit or a print shoulder around the image. A thinner EOM is the obvious remedy. A print appearing not as sharp may be the result of high print speed, low fabric tension, low ink viscosity, excessive flood coating, small snap distance or too much ink deposit. In addition to inversely adjusting these parameters, using an exposure calculator is recommended. If the snap distance has been adjusted incorrectly, the fabric tension is too high, the lift-off has been adjusted too progressively or if the fabric is locally clogged, only a part of the image may be printed. There may be a high temperature in the print shop and the fabric may be clogged locally due to prematurely dried ink or contamination. Moiré may occur if different halftones or halftone angles together create a new, disturbing image, or if the fabric related to the halftone image is too coarse. This problem can be minimized by using a finer fabric, or by changing the halftone or the halftone angle. If the tension of the fabric or snap distance is low, the freshly printed ink layer may show an impression of the fabric. Skin curing occurs if only the outer skin of the ink layer (which is closest to the UV lamp) is hardened out. It can also occur in the event there is too much ink deposit or if the transport speed through the UV dryer is too high. If the emulsion is unequally coated onto the fabric, or if the stencil has been developed irregularly, the result may be an inconsistent ink deposit. If ink wires, shaped like lightning bolts, appear in random direction connected to the image, it may be caused by static electricity. This is often associated with electric shocks and sticking substrates. Grounding the moving parts of press and substrate, and increasing the relative humidity are ways to resolve this issue. If the mesh opening of the fabric is too fine to transfer the pigment, gradually finer pigment is printed down onto the substrate, resulting in a gradual reduction of the density. This problem can be solved by using a coarser fabric. A good rule of thumb is the maximum pigment size should be one-third the size of the mesh opening. If the coating trough is insufficiently filled with emulsion, or if the coating speed is inconsistent, there may be poor emulsion distribution. Filling the trough completely and keeping the coating speed stable may solve the problem. Adhesion issues can stem from poorly degreased fabric prior to coating or underexposed stencil. With careful degreasing and proper exposure, the adhesion may ameliorate. Excessive squeegee pressure causes an intimate contact between squeegee, stencil and substrate, resulting in excessive stencil wear. Therefore, an exposure calculator is highly recommended to determine the optimum exposure. Reducing squeegee pressure might also be a remedy. 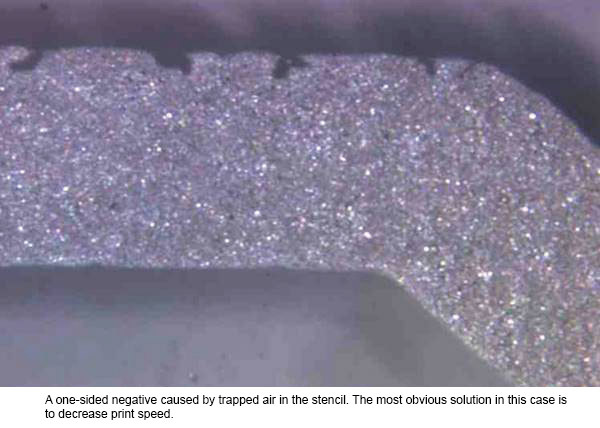 The use of an inferior quality of emulsion may result in excessive stencil wear as well, and can be solved by choosing a more dedicated emulsion. The fourth possible cause is printing with an abrasive ink, such as an OVI-ink. The stencil's life can be ameliorated by improving each successive parameter. 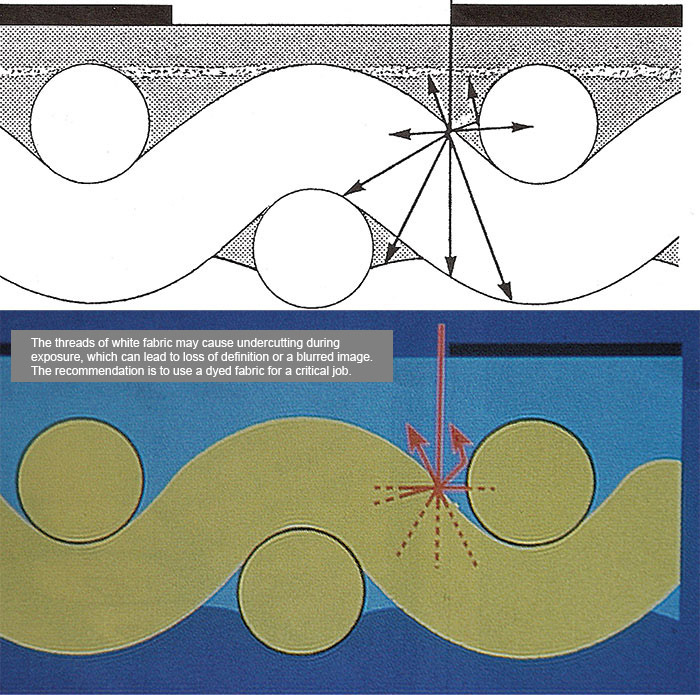 If squeegee pressure is unequally distributed across the stencil surface, or if the squeegee's print edge is damaged or worn out, the squeegee is too steep or too hard and stripes in print direction may appear in the freshly printed ink layer. A third, less frequently occurring possibility is an amount of ink has been forced to the opposite side of the squeegee. This can be prevented by regularly cleaning or exchanging the squeegee. A hard or steep adjusted squeegee, or a fine fabric will reduce the ink deposit. These possible causes can occur simultaneously. This issue is similar to insufficient EOM. If the contact edge of the coating trough is damaged, if there is dried emulsion on the contact edge of the coating trough or if the viscosity of the emulsion is high, there may be streaks in the coated emulsion. The problem may be solved by regularly cleaning the contact edge, exchanging the coating troughs or by reducing the emulsion's viscosity. Tiny holes in the ink layer may occur if the ink flow is insufficient, caused by high viscosity, or if the ink is free from silicones. It can also result from clogging fabric by contamination. Other possible causes are an incorrectly adjusted substrate's surface tension, a contaminated substrate or insufficient time between printing and drying. Changing these parameters or applying a thicker emulsion coat can help rectify this issue. Tiny holes in the stencil may be created during printing, caused by a thin EOM, insufficient EIM, dust on emulsion or film during exposure, or underexposure. A fourth possible cause is incompatible emulsion. This can usually be solved by a thicker emulsion coat, increasing the exposure time, attention to the cleanliness in the screen making room or by taking another emulsion. Possible causes include excessive ink deposit, insufficient dry capacity or a high dry speed. If there is too much time between printing and drying, ink can dry into the fabric. High ink viscosity, high ambient temperature, low relative humidity or strong airflow across the print area can also cause this issue. The printed ink may stop drying in after switching off the fans and/or by inversely changing these mentioned causes. A mottled print may result from high relative humidity in the print shop, high ink viscosity or insufficient density of the ink. Another possible cause is the use of a fabric that is too fine. This may occur if the ink dries in, if the snap distance is adjusted incorrectly, if the viscosity is adjusted incorrectly or if the ink density is too low. A last possible cause is if the thinner is not compatible with the used ink system. Air bubbles in the freshly printed ink layer can be caused by an incorrectly adjusted snap distance, high surface tension of the ink or if the ink contains too much flow agent. The latter may also affect the ink's adhesion. Adhesion can be improved by taking care of the hygienic characteristics in the print shop and the surface tensions. The problem is solved after removing the cause of the pinholes or the contamination. These can result from contamination on the substrate or dust in the image area. This occurs if the first layer is over-cured (intensively hardened out), or contains a large quantity of silicones. Another possibility is an overprinted ink layer that is too thin, and if the second ink layer is too thin, the overprintability will be insufficient. If the fabric with a ghost image is not carefully treated with ghost image remover agent, this may be visible in the next print. Correctly applying the cleaning procedure or using a new, clean fabric will minimize or completely remove the ghost image's visibility. If the ink deposit, snap distance or density of the used ink are too low, the density of the freshly printed ink layer will also be low. If the emulsion and the ink are not compatible, if there are already pinholes present in the stencil or if the exposure time is too short, the stencil may be damaged prematurely. Improving the compatibility, increasing exposure time and preventing the presence of pinholes in the stencil can help resolve this problem. Stripping issues with a stencil can be caused by an underexposed stencil, a stencil surface covered with screen filler or ink, or incompatible stripping agents. Ensuring the correct exposure time, cleaning the stencil surface and using proper and compatible chemicals to strip will improve the stencil's stripping characteristics. Located in the Netherlands, technical author Wim Zoomer writes stories on applications and various companies' successes. He has several published articles in screen printing and industrial technology magazines about flatbed and rotary screen printing technology for both graphic and industrial applications, such as printed electronics. He is the author of Printing Flat Glass, a book about architectural glass decoration processes. Wim has been a consultant of the European Screen Printing Manufacturers Association (ESMA) and board advisor of the US magazine, iSP (industrial + Specialty Printing). In 2010, he was inducted as a member of the Academy of Screen and Digital Printing Technology (ASDPT). Contact wimzoomer@planet.nl. This article appeared in the SGIA Journal May / June 2018 Issue and is reprinted with permission. Copyright 2018 Specialty Graphic Imaging Association (www.sgia.org). All Rights Reserved.